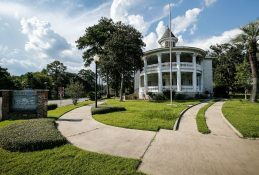 The Little White House in Warm Springs, where President Franklin D. Roosevelt spent much of his time in Georgia. 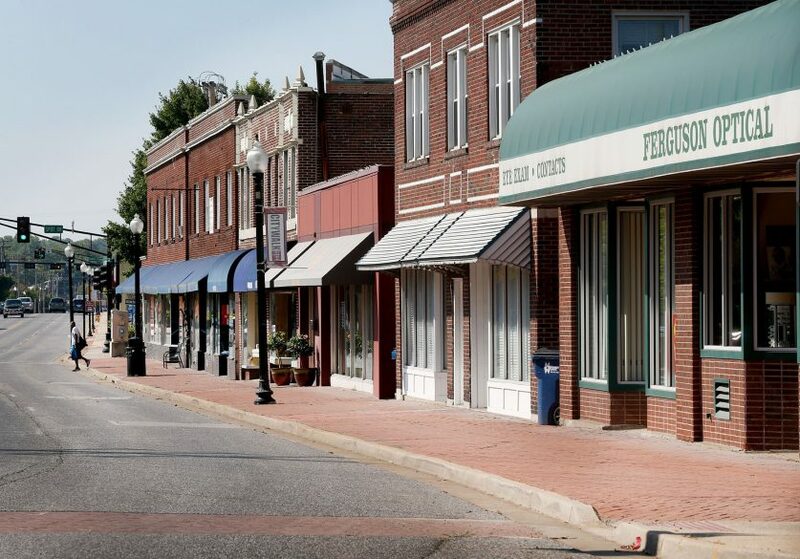 We are highlighting Warm Springs, Georgia this month in the Good Towns series. Spotlighting special towns across the country, Good Towns is about the character, the history, the people and the unique things that make a town a special place. 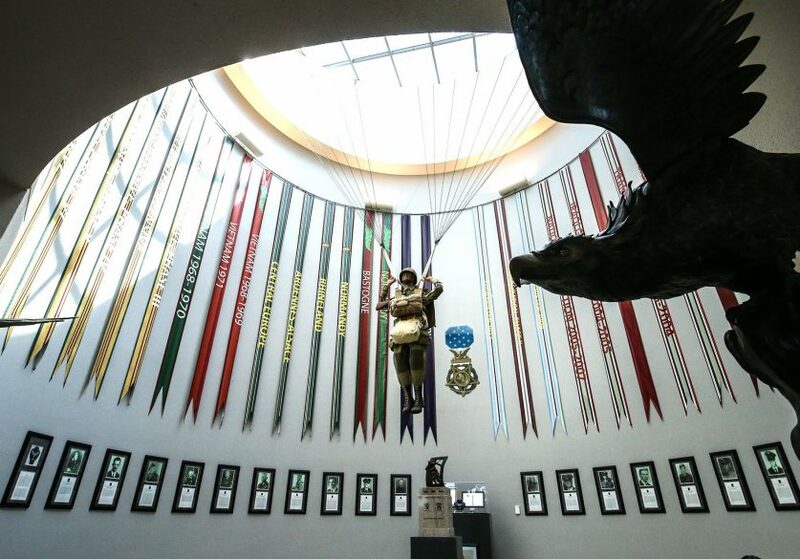 We hope you enjoy this story about Warm Springs and its many charms. Centuries before Franklin Delano Roosevelt first set foot in the warm, mineral-rich waters of Warm Springs, Georgia, forever securing the small town’s place in history, the water was a well-kept secret among Native Americans. Rising from a spring 3,800 feet below the earth’s surface at a constant temperature of 88 degrees, the waters were believed by the Creek and Iroquois to hold healing powers for the wounded and infirm. It wasn’t until 1923, long after troves of settlers moved into the state and forced the Native Americans westward, that prominent businessman and philanthropist George Foster Peabody told Roosevelt about the warm springs on the property he had recently purchased in Georgia. At that time, Roosevelt was three years out from a failed vice presidential run alongside Ohio Gov. James M. Cox. It was a devastating blow to Cox’s political career, but it set Roosevelt – a handsome, wealthy New Yorker – on the course for a future run for the White House. 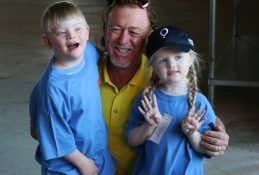 Those hopes were momentarily dashed the following year when, at the age of 39, Roosevelt was stricken with polio, a crippling and potentially deadly infectious disease that mainly struck children. It left Roosevelt without use of his legs. It was two years after his diagnosis that Roosevelt’s good friend Peabody shared with him the story of a young polio victim who found relief while bathing in the spring-water pools at Peabody’s Georgia resort. Desperate to find relief from his own pain and paralysis, Roosevelt visited Peabody’s resort in October 1924 in search of a cure. David Burke is relaying this story from inside the FDR Memorial Museum on the grounds of Roosevelt’s Little White House in Warm Springs, an hour northeast of Columbus. He is a human encyclopedia on all things involving the springs, and he shoots off Roosevelt facts in rapid-fire succession, as if time were of the essence. He says it is impossible to talk about the springs without bringing up Roosevelt, which means he has enough working knowledge of the 32nd U.S. president to be known by tour guides as the local historian. Burke’s official job title is Interpretive Ranger. He’s the first to greet the throngs of third- and fifth-graders that pour out of school buses and chartered coaches onto the Roosevelt’s Little White House campus. On this day, as many as 500 children are expected and that doesn’t count the individual tourists and small groups that drop in without reservations. 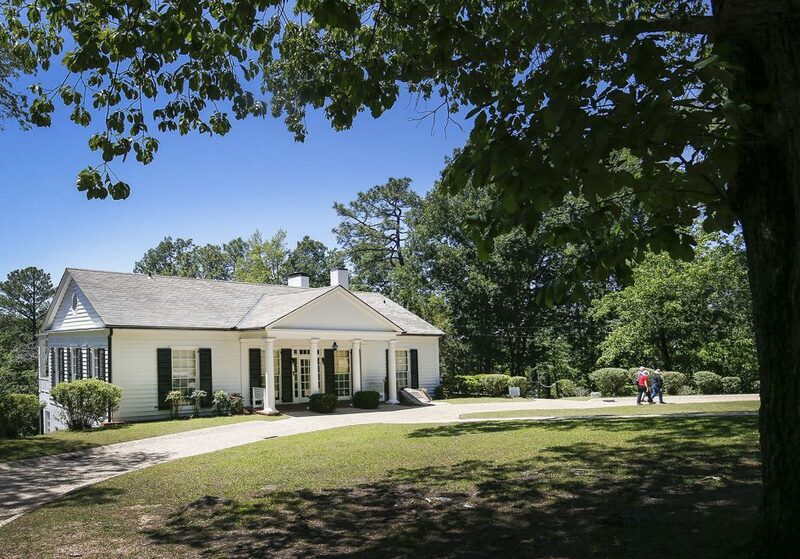 As many as 100,000 people walk though these doors each year, making Roosevelt’s Little White House one of Georgia’s most popular historical sites. The campus, which includes FDR’s Memorial Museum and Roosevelt’s vacation home, as well as the servants’ quarters and guesthouse, is open to the public daily except for Thanksgiving, Christmas and New Year’s Day. David Burke (top photo) shares his love for and knowledge of the Little White House with visitors to the FDR Memorial Museum. The museum shows how the Roosevelts lived in Warm Springs (bottom left). Seventy-plus years after FDR’s death, the house remains unchanged. “I tell them that thanks to FDR, I don’t have polio,” he says, leaning forward for emphasis. “Then I ask if they wear seat belts. I tell them I was a stupid teenager and didn’t wear a seat belt. 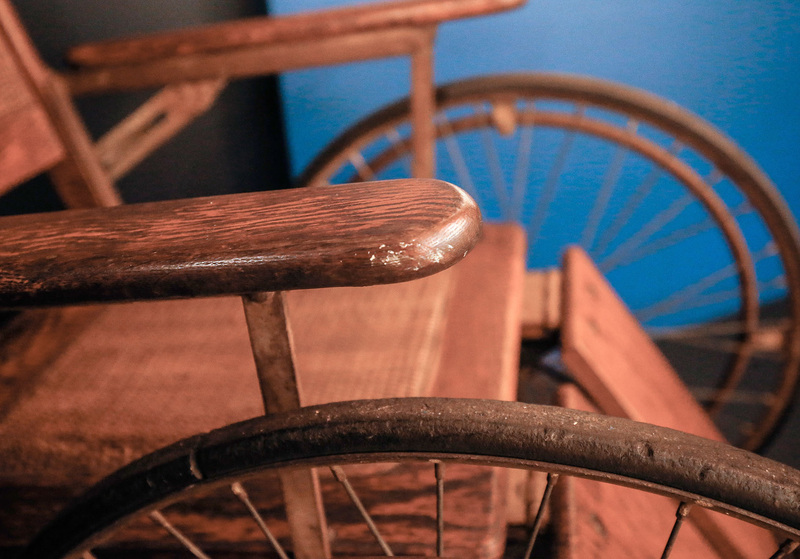 I got in a car wreck and that’s how I ended up in a wheelchair.” His candid rapport quickly puts the room at ease and opens the door for him to pepper the crowd with more information about the springs and the hope it instilled in Roosevelt. It is the same hope that inspired a nation to believe in a cure for the disease that paralyzed the country, Burke explains. And it began with Roosevelt’s first visit to the area. He dipped into the warm pools of mineral-rich spring water, began swimming, and immediately felt an improvement. For the first time since he was stricken with polio, he was able to move his right leg. Roosevelt’s prominence as a national politician shined the spotlight on the little town then known as Bullochville. A syndicated Sunday newspaper supplement featured his experience and his search for a cure in the warm spring waters of Georgia. By the time Roosevelt returned to Bullochville a year later – which by then had changed its name to Warms Springs – countless other polio victims were flocking to the area inspired by his message of hope. When guests came to Warm Springs for the treatment of polio, they stayed at the Meriwether Inn, a four-story, 300-room, Victorian-style hotel Roosevelt described as “ramshackle,” or one of the cottages on the resort. The inn provided several pools filled with the warm spring water for its guests, as well as a pool for general public use. This is where Roosevelt not only soaked, but was also filmed playing and laughing with children stricken with the same ailment. In 1927, Roosevelt purchased the Meriwether Inn, the pool complex, and the surrounding 1,700 acres from Peabody and founded Roosevelt Warm Springs Institute on the grounds to promote the healing of polio’s effects on its victims through hydrotherapy. The following year, Roosevelt was elected governor of New York. But he came back to Warm Springs that Thanksgiving to dedicate a new glass-enclosed pool and pool house to the public area. A cure for polio has never been found. But in 1955, 10 years after Roosevelt’s death, Jonas Salk, M.D., working off a grant from the Foundation for Infantile Paralysis, developed a vaccine that would lead to the eradication of polio in the U.S. 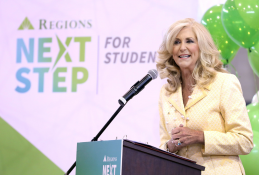 Afterward, the foundation, which since changed its name to the March of Dimes, redirected its mission to focus on birth defects, premature birth and infant mortality. Through the decades, the public spring pools began to deteriorate and were shuttered sometime in the 1960s. Soon after, they were practically forgotten. Rita Hutcherson, a tour guide with Roosevelt’s Little White House, said that when she moved to Warm Springs in the 1970s, she had no clue of the treasure hiding behind the white pool house. In the early 1990s, renovations were done to save the pools and they were opened for limited public bathing through the early 2000s. When the pools started leaking and threatening the integrity of the historic site, they were permanently drained. 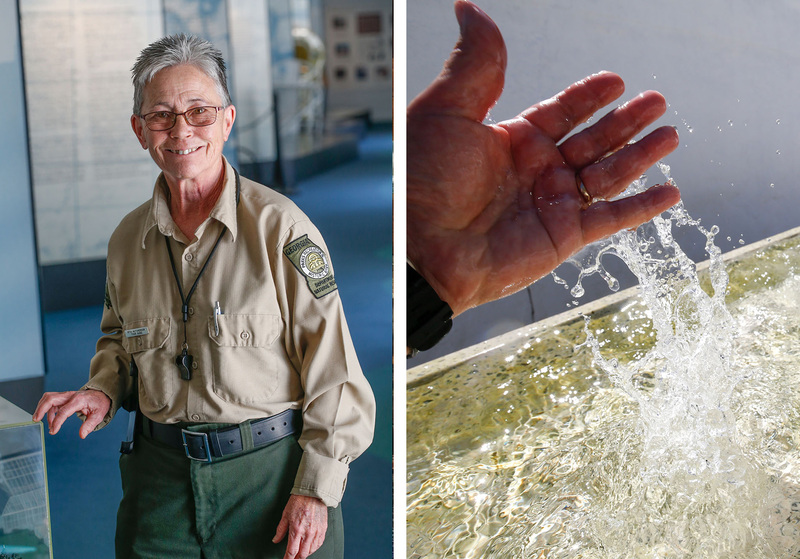 The man-made pools Roosevelt and others used for their healing powers are now empty, yet the history of the Roosevelt Warm Springs Institute remains alive thanks to the work of people like Rita Hutcherson, a tour guide. Visitors can still feel the warm, bubbling water and see the remaining operating therapeutic spring water pools. 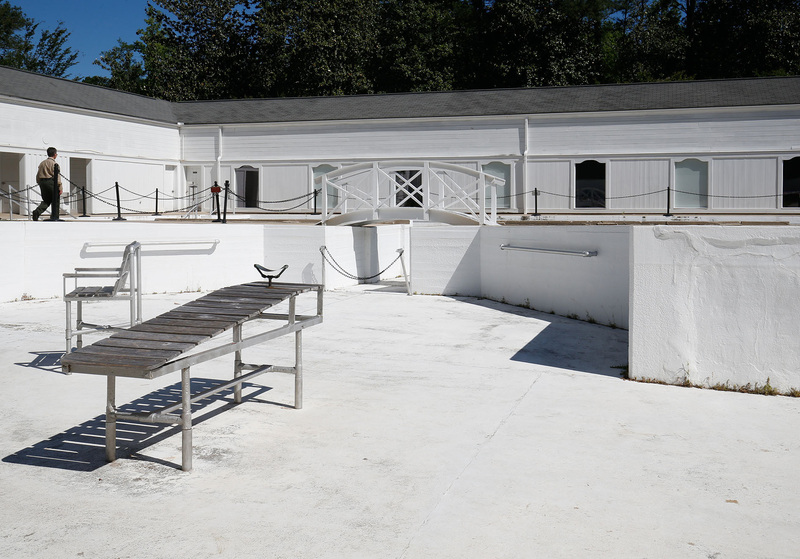 Today, the unassuming one-story, white exterior of the Historic Pools Museum, about a five-minute drive from Roosevelt’s Little White House, leaves much to the imagination. Inside, photographs and models show what the bathing facility looked like in its heyday. Now, the glass enclosure is gone and the pools stand empty, painted white and cracked from age. The white-on-concrete is hardly pleasing to the eye, but the pools were painted white for a purpose – to show guests the natural blue hue of the spring water. Visitors, however, can still feel the water bubbling up from a basin inside one of the pools. Some guests rub the water on their arms and legs, others cup their hands and take a gulp. Drinking the water is strongly discouraged by the tour guides, but consuming it isn’t believed to cause harm. “I’ve seen some people dip their entire heads in it,” Hutcherson says. The years were far kinder to the Roosevelt Warm Springs Institute. In 1933, Roosevelt built Georgia Hall to serve as the institute’s main building. The following year, the dilapidated Meriwether Inn was demolished. 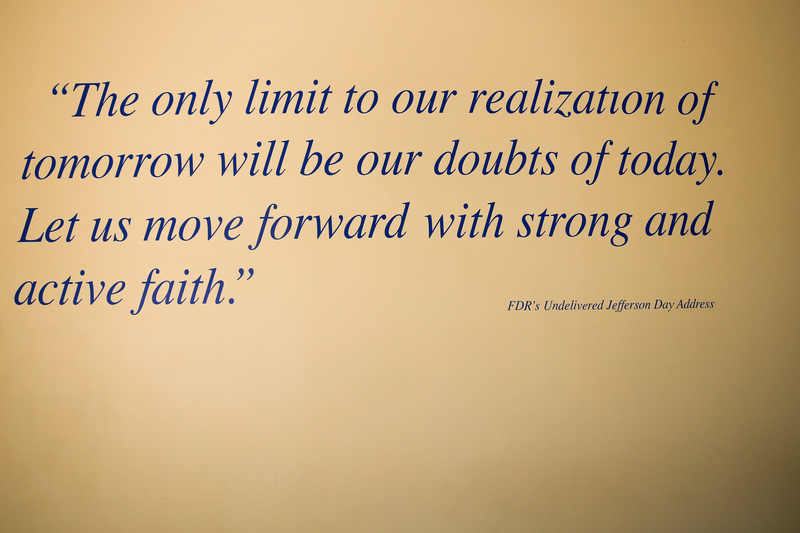 Since then, the institute has grown from a medical and therapeutic campus offering care for those with polio, into a comprehensive rehabilitation center providing technological advancement, program diversity and continuing education for persons with a variety of disabilities. The campus also houses the only operating warm spring water pools, but they are only for therapeutic use by those affiliated with the institute. Roosevelt visited Warm Springs nearly two dozen times before deciding to build his own home on a large, wooded lot on the northern slope of picturesque Pine Mountain. The house was completed in 1932, just months before he was elected to his first term as president. 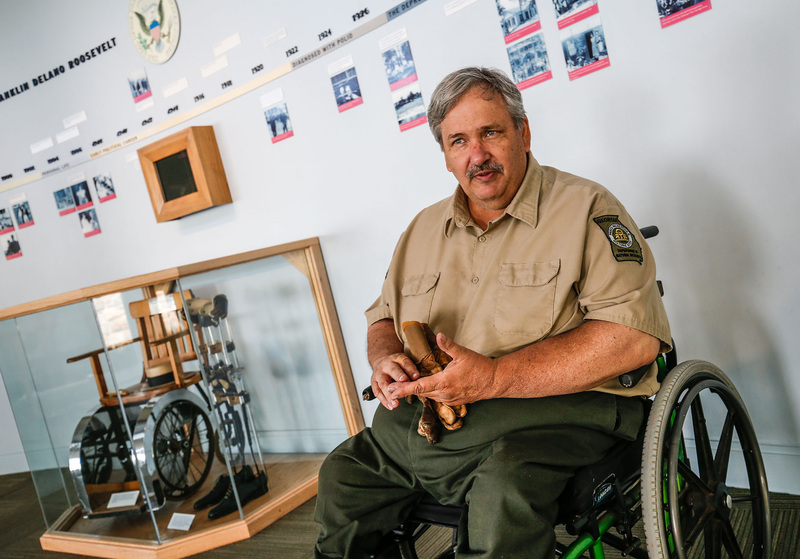 Artifacts on display include the car Roosevelt used in Warm Springs — with the personalized tag — and a wheelchair. 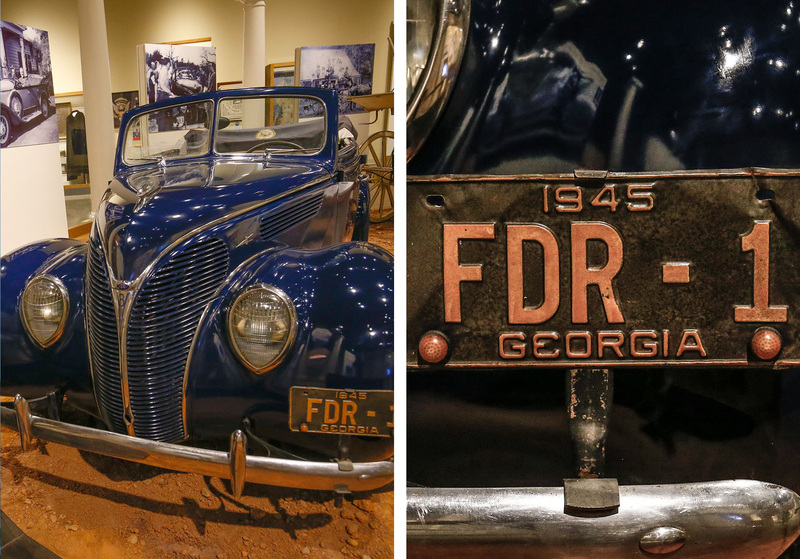 The tour of Roosevelt’s Little White House complex begins with the FDR Memorial Museum, a new 11,000-square-foot building that provides space to showcase several artifacts from the Roosevelt era, including his 1938 Ford convertible custom equipped with hand controls. Visitors can also watch a short film narrated by Walter Cronkite that includes footage of the president visiting with neighbors and swimming in the pools. A walking path leads to the site’s centerpiece – FDR’s vacation home, along with the unattached servant’s quarters and guesthouse. The structure is modest in size consisting of a small entry, living room, three bedrooms and a kitchen. 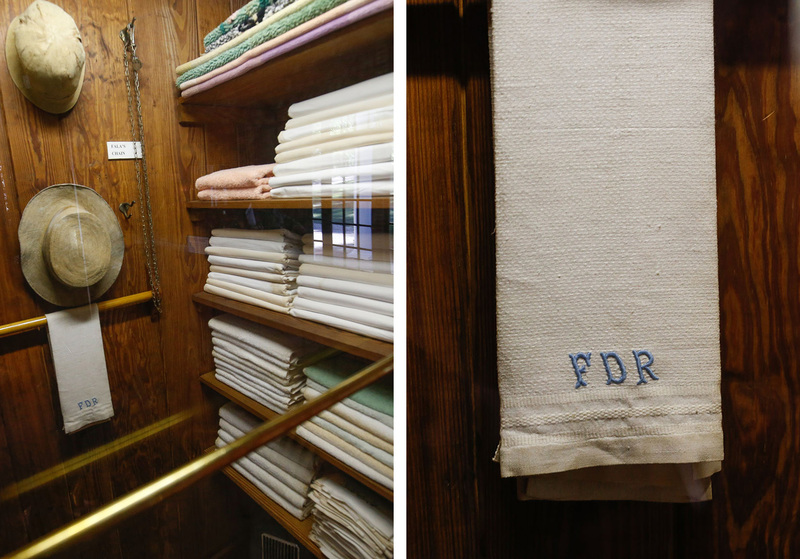 The house is frozen in time with original furnishings from when Roosevelt drew his last breath there on April 12, 1945, from the neatly folded linens in the front closet to the weathered roll of paper towels and two “pull bones” from a cooked chicken in the kitchen. The year Roosevelt’s Little White House was constructed was one of the bleakest years of the Great Depression. At least a quarter of the American workforce was unemployed. People in the poor farming community of Warm Springs were also struggling, and Roosevelt was afforded the keen opportunity to personally witness the blight of the American people through the eyes of his Warm Springs neighbors. Once elected, Roosevelt worked swiftly to try to stabilize the economy and provide jobs and relief to those who were suffering. 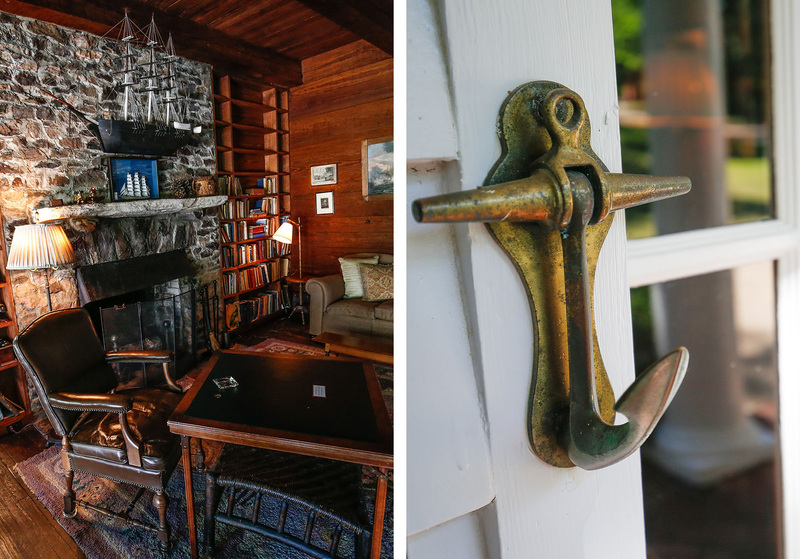 It is believed that much of the planning of the experimental projects and programs known collectively as the New Deal were conducted in and inspired by Roosevelt’s Warm Springs vacation home. 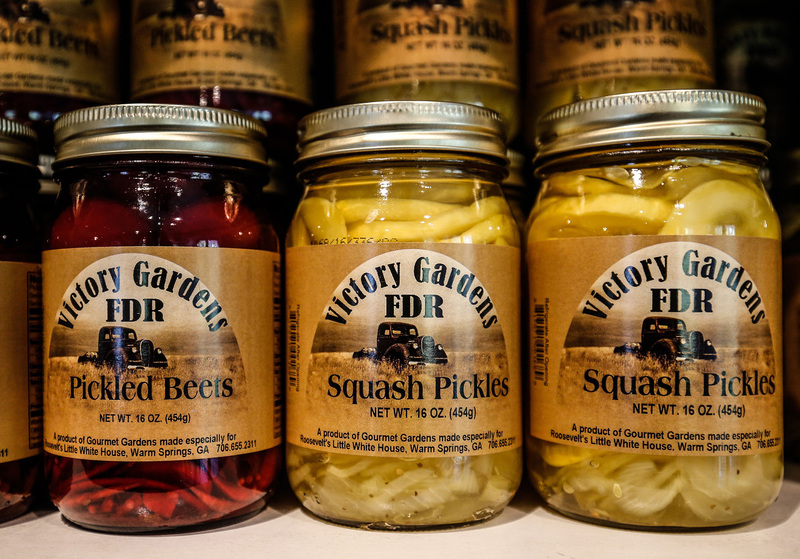 Everything remains the same as it was the moment FDR passed away while Victory Gardens vegetables are still sold in jars that harken to the era. All of Roosevelt’s visits to Warm Springs began and ended at the Southern Railway Depot just steps from the town center. His arrivals and departures were often met by throngs of well-wishers hoping to get a glimpse of their hero. The train ride from Washington, D.C. to Warm Springs took an entire day, and his visits usually lasted two to three weeks. In the 1950s, the depot was demolished and the tracks removed. A historical marker and a replica of the old depot, serving as the Warm Springs Welcome Center, now mark the location. Down the street from the depot is one of the most recognizable features in town, Hotel Warm Springs. This three-story, circa-1907 bed and breakfast has much of the building’s original character, from the green-and-white mosaic tile floors in the parlor to the creaking wooden floors and sprawling staircases. Guestrooms line the first and second floors. 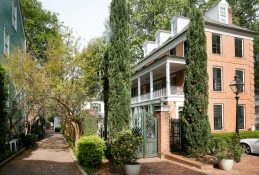 A full Southern breakfast is served in the dining room on the third floor, which also houses the residence of the inn’s owner, Gerrie Thompson. A hobbyist at heart, Thompson was visiting Warm Springs in 1983 from her home in Thomaston, delivering handmade crafts to be sold in some of the shops along Broad Street, when she laid her eyes on the old hotel. It had stood empty for the past five years and by all accounts had been largely ignored. The wallpaper was ripped. The plaster walls, cracked. “Water poured into the third floor like Niagara Falls,” Thompson recalls. It was an eyesore in every sense of the word, but it was beautiful in Thompson’s eyes. She bought the building and immediately started renovations. “It took a lot of TLC and a lot more money!” she says. Thompson converted the public restrooms to provide private bathrooms for each guest room and gave the walls a fresh coat of paint. She also used her crafting skills to sew all the window coverings and stencil welcoming pineapples along the parlor walls. And because she wanted to do “something a little different” in this antique-dressed inn, she installed a heart-shaped tub in what she refers to as the Honeymoon Suite. The hotel lines Broad Street along with about a dozen shops selling crafts and novelties, or, as one shopper affectionately described the merchandise, “Whatnots.” Eateries here include the Bulloch House Restaurant, which serves up a Southern buffet of fried chicken, fried green tomatoes, and green beans cooked in bacon. The restaurant also sells homemade cakes, pies and pastries. 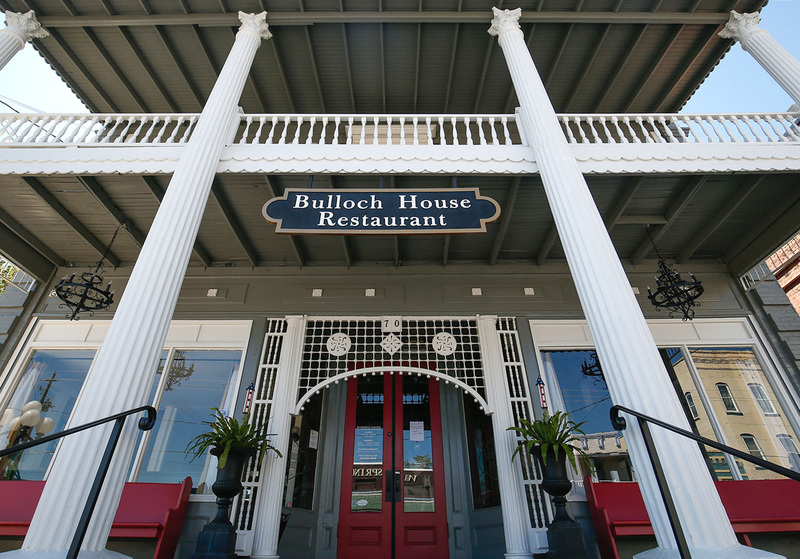 A meal at the Bulloch House Restaurant remains a must for anyone visiting Warm Springs in 2017. While browsing the shops along Broad Street one thing becomes apparent – there are a lot of motorcycles here. Follow the path behind the Bulloch House Restaurant and the town opens up into another welcoming community anchored by Xtreme Rider, a motorcycle leather shop open just four days a week, Friday through Monday. Dan Forrest opened the shop 13 years ago after driving through the area from his home in LaGrange. Every April since, he has hosted anniversary celebrations, as well as a Labor Day event, each of which draws more than 500 bikes. Warm Springs is an ideal distance for motorcyclists traveling from more populated places like Atlanta, Macon, or Montgomery, Alabama. These 2- to 2.5-hour rides, “It’s what we in the industry call a ‘destination ride,’” Dan explains. Whether traveling by motorcycle or car, the Meriwether-Pike County Scenic Byway is an ideal way to take in the area. Approved in 2005 by the Georgia Department of Tourism, the Byway is designed to celebrate the legacy of Roosevelt in west Central Georgia. The scenic highway retraces some of Roosevelt’s favorite routes through Meriwether County. The Red Oak Creek Covered Bridge, still standing after nearly two centuries, beckons visitors who want to explore scenic Georgia. The Byway route can be picked up anywhere along the 55-mile loop but the logical departure is at the Warm Springs Welcome Center. The route turns up GA 85 toward the town of Gay and takes a slight detour onto Covered Bridge Road to the Red Oak Creek Covered Bridge. Built in the 1840s, the bridge is a rare example of the ingenuity of famed bridge builder and freed slave Horace King. 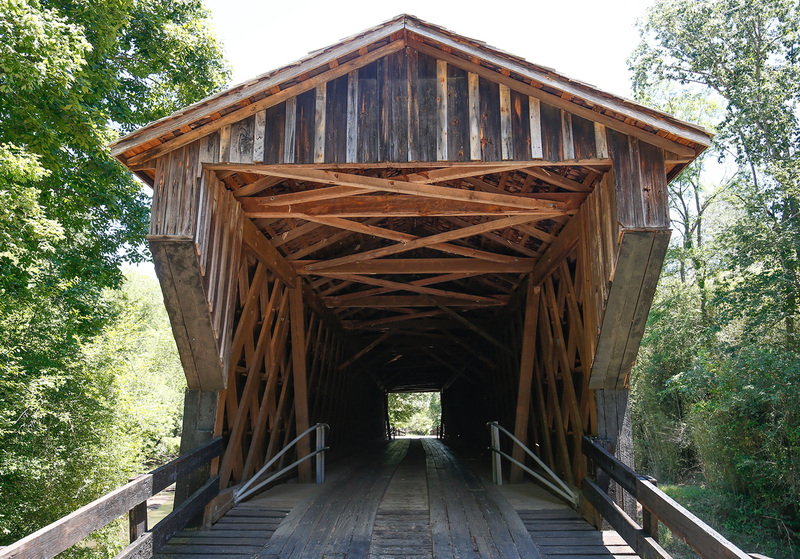 It is the oldest wooden structure among Georgia’s 16 covered bridges. 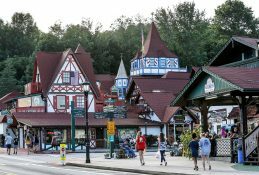 (Others include the Concord Covered Bridge in Smyrna, Cobb County, and the Stone Mountain Covered Bridge in DeKalb County’s Stone Mountain Park.) The route continues north, moves eastbound along Flat Shoals Road across Flint River, then bends southwest eventually tying back into SR 190 to Warm Springs. The route touches the 9,000-acre F.D. Roosevelt State Park, the largest of Georgia’s state parks. It is a hiker’s haven with more than 40 miles of trails that wind through hardwood and pines, over creeks and past waterfalls. The area also provides cottages and a Liberty Bell-shaped swimming pool fed by cool springs, all of which were built by the Civilian Conservation Corps during the Great Depression. There is also a wooded campground near a small fishing lake and private stables offering guided horseback rides. Dowdell’s Knob remains a destination spot for hikers on the Pine Mountain Trail. 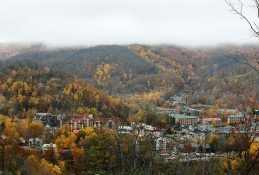 Rising above an area known as King’s Gap is one of Roosevelt’s favorite spots, Dowdell’s Knob, named for a 19th century farmer who lived in the area. The view from Dowdell’s Knob spans for miles. It is a popular hiking destination along the Pine Mountain Trail, but can also be accessed by car. 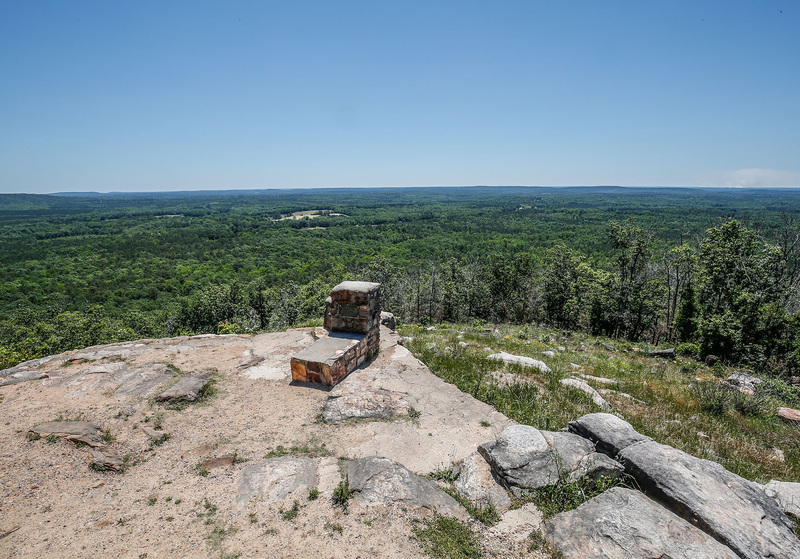 On the edge of the knob are the remains of the barbecue grill where many of Roosevelt’s picnic meals were prepared. A personable man, Roosevelt was said to have stuck up conversations with others he encountered here, often discussing farming or education or even the national economy while gazing down on the world below. Some of those he conversed with never realized they had been talking to the President of the United States, according to local lore. In 2007, a life-sized statute of Roosevelt looking off into the distance was placed at Dowdell’s Knob. It was designed to be historically accurate and, according to the Georgia State Parks, is the only Roosevelt statute that shows the former president wearing leg braces. People who greeted Roosevelt when he arrived at the Southern Railway Depot in late March 1945 for his 41st visit to Warm Springs said he looked pale. His trips here had been infrequent during World War II. With victory apparent, and an unprecedented fourth-term presidential win freshly under his belt, Roosevelt took the opportunity to steal away to his beloved vacation home. On this visit, he held official meetings with the president of the Philippines and the secretary of the treasury. But he would also have time to relax and reflect. It was a warm day on April 10, when Roosevelt’s Secret Service agents drove him through the winding roads along Pine Mountain to Dowdell’s Knob. Instead of having his aides lift the seat out of the car for him to sit on, he asked them to walk back down the road and not return until they heard him honk the car’s horn. For two hours, Roosevelt sat alone in the warm sun and gentle breeze. His thoughts are anyone’s guess. Two days later, as Roosevelt was sitting in a favorite chair near the stone fireplace in his Little White House posing for a portrait by artist Elizabeth Shoumatoff, he complained of a serious headache. It was after lunch, and Shoumatoff had just begun her first brushes of Roosevelt’s face with dabs of peach-toned watercolor. Suddenly, Roosevelt waved his hand in front of his face and collapsed. Aides quickly carried him into his adjacent bedroom and worked feverishly to save his life. At 3:35 p.m. Central War Time, President Franklin D. Roosevelt was pronounced dead. The next day, the same train that had brought him into Warm Springs for his visits, carried his body out in a coffin amid a sea of local mourners. His body was taken to Washington, D.C., for a memorial before being laid to rest in the garden of his home, Springwood Estate, in Hyde Park, New York on April 15, 1945. An unfinished.portrait of FDR serves as a memorial to his untimely passing. 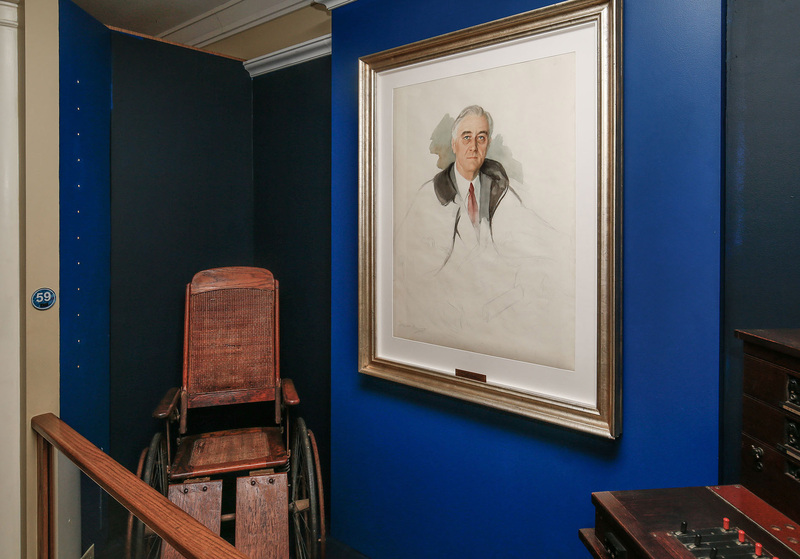 But Roosevelt’s spirit continues to live in Warm Springs, not only in his vacation home or at Dowdell’s Knob, or even in the Unfinished Portrait that hangs among his other artifacts in the museum at Roosevelt’s Little White House. He lives in the memories and the stories handed down from the locals who still call the man “friend,” the ones who know best what Warm Springs meant to Roosevelt. 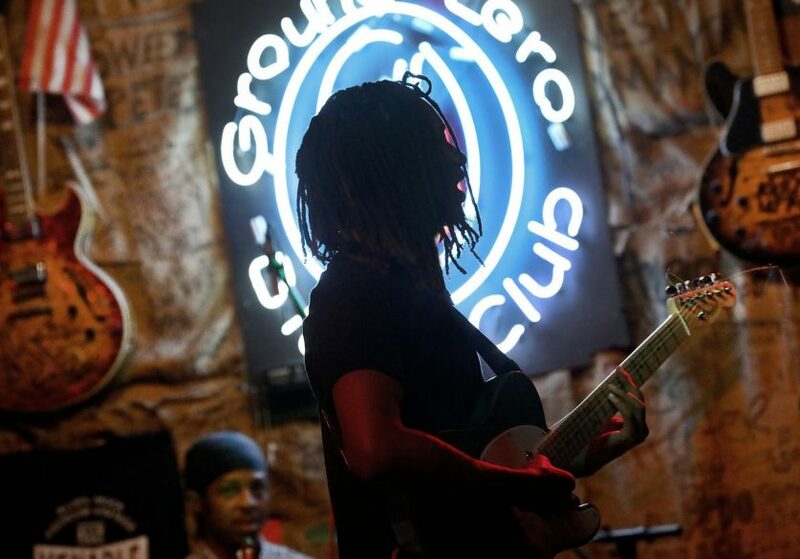 Home of the Delta Blues, this crossroad of cultures gave birth to a uniquely American sound.